Adi Andrews sadly passed away on October 22 2012. 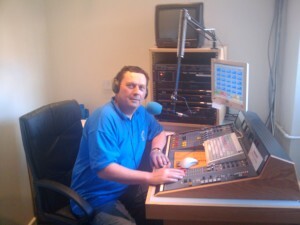 In the four short years that Adi had been a member of Hereford Hospital Radio we realised he was a diamond volunteer. He had a natural charm that made our patients feel at ease with him, and was the most excellent communicator on the radio. Adi used these skills to train other volunteers in the art of being a broadcaster, and he helped and coached many who have gone on to further their careers in broadcasting. The team at Hereford Hospital Radio will miss him greatly, but we have fond memories to treasure of him; his wit and laughter, the banter we all had on air with him, and the way he put people at ease when they stepped into the studio. For the many people around the county who attended Adi’s discos at Young Farmers Events or welcomed him along as the DJ on the day they tied the knot, we know Adi would have always ensured everyone had fun and a great evening to remember. Nikki, Adi’s widow, is also a member at Hereford Hospital Radio and through Adi’s encouragement she has been on air regularly over the last year. All of us at HHR send our condolences to Nikki and her family.